Wondering if stained concrete is right for you? To help you decide, here are answers to common questions about stained concrete benefits, appearance, performance and maintenance. Concrete Arts in Hudson, WI. 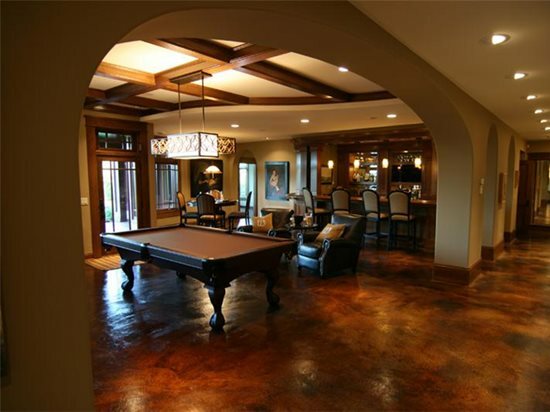 Stained concrete appeals to many people who want to achieve unique decorative effects for a reasonable cost. For as little as $2 per square foot, you can use stains to create an infinite array of colors and special effects on both interior and exterior surfaces. Concrete stain does more than simply add color. Rather than produce a solid, opaque effect like paint or colored coatings, stains permeate the concrete to infuse it with rich, deep, translucent tones. Some stain manufacturers use adjectives such as "antiqued," "variegated," or "mottled" to describe the distinctive look. Even when treated with the same staining product in the same shade, no two concrete floors, walls, or countertops will look alike due to factors such as the composition and age of the concrete and surface porosity. Another factor to consider is safety. When working with acid-based chemical stains, it’s important to take the proper precautionary measures because they often contain corrosive components that can cause eye and skin irritation and produce strong odors. The most important consideration is the condition of the surface. If the concrete is covered by grime, glues, coatings, curing membranes, or sealers that inhibit the stain from soaking in, the stain won't be able to penetrate and achieve full color development. Your color options will vary depending on whether you are using an acid or water-based stain. With acid stains, your color choices will be limited. Most manufacturers offer only eight hues, mostly subtle earth tones, such as tans, browns, terra cottas, and soft blue-greens. Although the basic color palette is sparse, you can mix two or more stain colors before application to achieve a different shade or apply one color over another. You can also produce deeper color effects with a stain by applying two coats. Most stain manufacturers will provide color charts or even actual samples of stained concrete to help you visualize the options. Contractors may also be able to provide samples of the various stain colors they work with. Using stains in combination with dyes (see Concrete Dyes Expand the Color Palette of Concrete Stains). To see several examples of what creative contractors are doing with concrete stain, used alone or in combination with other decorative techniques, see Six Concrete Staining Techniques Revealed. Non-reactive water-based stains (typically a blend of acrylic polymers and pigments) fill the pores of the concrete surface to produce a colored film or coating, ranging from translucent to opaque depending on the product. The key difference is that no chemical reaction takes place, so the color is more consistent. Most of these products are also low in VOCs (volatile organic compounds) and safer to apply because they are free of solvents and acids. To learn more, read New Products for Staining Concrete. The cost of staining will vary considerably depending on the complexity of the stain application, surface prep requirements, and the size of the project. A basic one-coat application of stain on concrete requiring minimal surface prep will run about $2 to $4 per square foot, while more elaborate staining projects involving multiple colors and special design details can cost $15 per square foot or more due to the time and skill level involved. See this overview of stained concrete costs and price ranges. Although concrete stain is permanent and won't flake off like paint, it penetrates only the top layer of the concrete surface and will eventually wear away as the surface is worn by traffic or weather exposure. To prolong stain life, you should protect exterior stained concrete surfaces with a clear sealer and interior floors with a good floor wax. To keep your stained concrete looking its best, you will also need to clean it periodically by dry dust mopping and occasional wet mopping with a neutral-pH cleaner. Get more tips on how to seal and maintain stained concrete.